Sometimes, though, someone just gets a simple new idea. I have always loathed putting clean silverware away out of the dishwasher. I’m not quite sure what is so horrible about it, but I have never liked it. I would always put away all the other dishes first, then do the odious flatware task last. About a year ago, I bought a new dishwasher to replace the one my mother had given me when I bought this house 15 years ago. It was time. It’s not much different than the old machine: mostly it’s much quieter and a bit smarter (it measures the opacity of the draining water so it can increase the wash cycle length if things are still too dirty). The real innovation, though, is the silverware rack. It’s just a thin tray at the very top of the interior that pulls out. It his vertical projections so that you can put knives, forks, and spoons in it lying on their sides. No more baskets of semi-vertical flatware clanking around in the bottom tray. I long ago went to keeping flatware in an open multi-compartment basket on a countertop. Digging through a silverware drawer gave me the same creeps as wrestling the flatware out of the dishwasher basket. Now, I can just slide open the tray, scoop out a handful of flatware, and quickly sort it into my basket. For reasons I still don’t fully understand, it took the job from being the most undesirable part of cleaning the kitchen to a trivial, even pleasurable process—and it takes a fraction of the time. 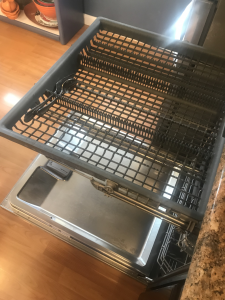 I don’t know if this innovation has been around for decades and I just missed it, but what is interesting to me is that there is nothing in this “technology” that couldn’t be directly ported back to the dishwashers of the 1960s. It would have made my childhood a tiny bit less traumatic.